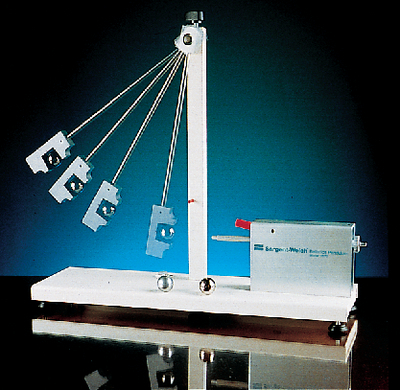 This set has three devices in one: a ballistic pendulum, a second law of motion apparatus, and a projectile gun for trajectory experiments. The projectile gun propels a steel ball into a wedge-shaped hollow in the pendulum bob. A precision roller clutch with needle bearings at the pivot point stops the pendulum at the peak of its swing, so students can measure the height and angle of the pendulum precisely. The roller clutch can be disabled to allow the pendulum to swing freely. It can also hold the pendulum out of the way when students use the projectile gun for trajectory experiments. The spring-powered projectile gun offers a choice of different compressions for a variety of initial velocities and features a mounted trigger for easy operation and visibility. The shaft of the projectile gun is double ended, so it works as a second law of motion apparatus when used with two balls. Adjustable feet and a built-in bull’s eye level make setup easy. Ordering information: The apparatus includes complete instructions and three 1" drilled balls: two steel and one aluminum.